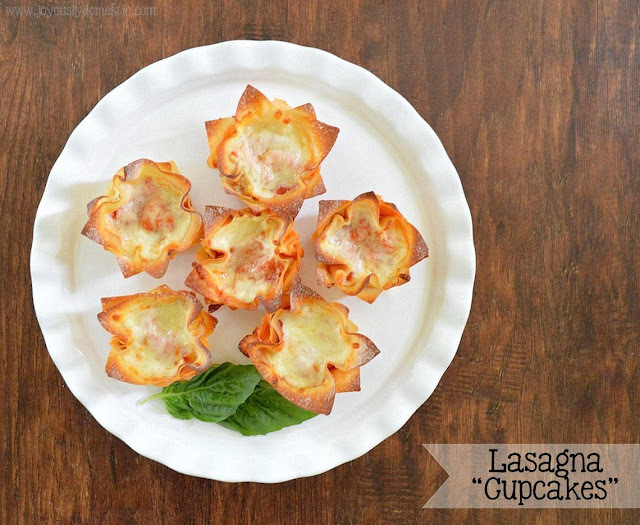 Lasagna "cupcakes" are super popular in the JD household. And, I love making them because I can get a pan of these into the oven from start to finish with only like, fifteen minutes of prep time. That's quite a difference in time compared to making full blown traditional lasagna. But, the flavor and texture is still all there. Winner! Making lasagna in cupcake form solves the issue of everyone fighting over those coveted corner pieces of a traditional pan-baked lasagna. Everyone gets crispy edges here, folks. (The edges will crisp while the bottom part softens and takes on the texture of regular cooked lasagna noodles.) And, another "plus" - these are just so darn cute. These allow me to get my kids busy in the kitchen ... the layering is just so much fun! Also, using square wonton wrappers means no boiling noodles and is a total timesaver. NOTE: Ground beef or Italian sausage could easily be added into one of the layers or combined with the sauce if you'd like a meaty version. Also, fresh spinach is a great add-in to one of the layers. Preheat oven to 375 degrees. Spray the wells of a regular-size muffin tin with cooking spray. Press a wonton wrapper into the bottom of each well of the muffin tin. Start layering your lasagna cupcakes. Spoon in a small dollop of ricotta (or cottage) cheese. Sprinkle on a little Parmesan and mozzarella. Top with a small spoonful of sauce. Press another wonton wrapper onto sauce in each well. Repeat another layer of ricotta (or cottage cheese), Parmesan and mozzarella. Do not add sauce in this layer. Finish by pressing a final wonton wrapper into each well on top of cheese layer. Spoon on a small amount of sauce and finish with a pinch of mozzarella cheese. Bake for 18 - 20 minutes or until edges are brown. Remove from oven and let cool for three minutes. To remove, use a knife to loosen the edges and then pop each lasagna "cupcake" out. Garnish with chopped basil or parsley, if desired, and serve. 07/17/16: Updated photos and made clarifications to recipe. I will email you this info, too, but figured I'd respond on here for the sake of anyone else wondering the same. Wonton wrappers are purchased ... I usually find them in the cold section of my produce dept at WM - by the packaged salads and cold salad dressings. I've, also, seen them in the refrigerated section of other stores near the refrigerated health food items like, soy dogs, etc. They come in a package of around 40 - 50 (per my experience) and the price runs around $2 or so. They can be large squares, small squares or even circles. Hope this helps. They were really good ... Had them for dinner with garlic bread... I think I didn't use enough sauce though mine were a little dry so I ate them with tomatoes... AWESOME idea and than you for the recipe! I would think these would be a great prep-ahead option ... I would just make sure to wrap the muffin pan really well in plastic wrap so that the wonton wrappers don't dry out overnight in the fridge. Then, I would think you could bake them off shortly before service.